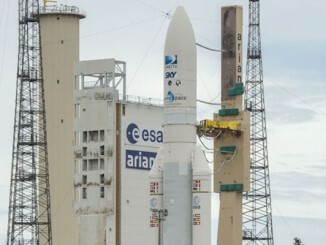 A European Ariane 5 rocket fired into a clear blue sky over French Guiana on Wednesday, delivering to space a powerhouse satellite for Australia’s government-backed $1.2 billion nationwide universal broadband network and Argentina’s second communications satellite. After a smooth countdown that started before dawn Wednesday, the Ariane 5 rocket’s clean-burning Vulcain 2 main engine lit with a rush of flame at 2030 GMT (4:30 p.m.), followed by a computer-run status check and ignition of two powerful solid rocket boosters to propel the 18-story launcher skyward. Packed with two satellites with a combined weight of nearly 10.4 tons, the Ariane 5 soared east from its jungle launch pad, spanning the Atlantic Ocean in less than a half-hour before the rocket’s second stage HM7B engine switched off after reaching an elliptical geostationary transfer orbit. 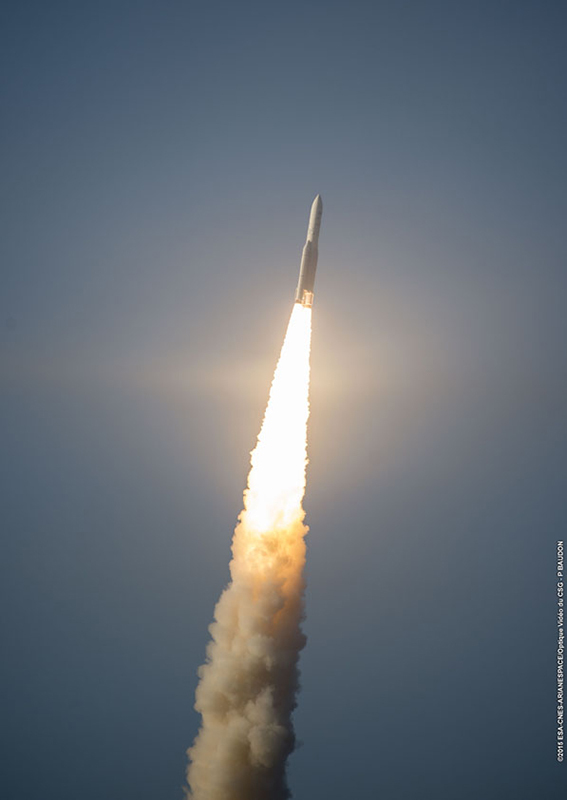 Then came delicate maneuvers by the Ariane 5 upper stage to deploy the dual payloads — first Australia’s 14,197-pound Sky Muster broadband Internet satellite, then Argentina’s 6,563-pound Arsat 2 telecom station. The late afternoon liftoff marked the Ariane 5’s fifth flight of the year, and the heavy-lifter’s 82nd mission since 1996. The owners of both satellites confirmed ground controllers established contact with the newly-launched craft, which were in good shape following Wednesday’s trek to orbit. Each satellite will conduct orbit-raising burns over the next few weeks to circularize their paths around Earth at 22,300 miles altitude over the equator. Mission managers declared the launch a success during traditional post-launch speeches inside the Jupiter control center at the French Guiana space base. 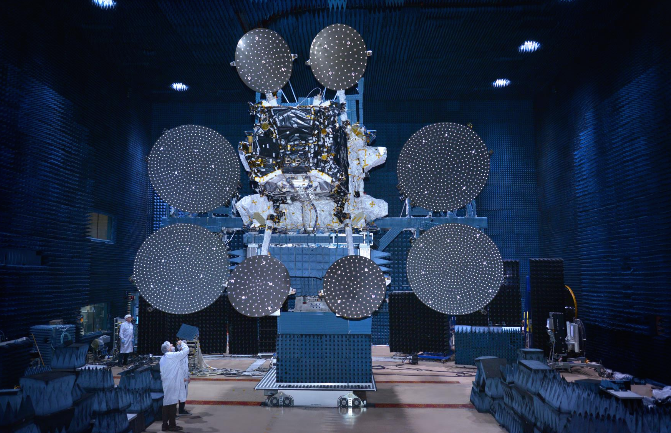 Sky Muster is the first of two huge communications satellites ordered by NBN Co., an enterprise established by the Australian government to set up a nationwide broadband system to ensure every Australian home and business is connected by 2020. The network will eventually reach eight million homes and businesses, many through terrestrial fiber connections, but around 200,000 customers will require satellites to achieve broadband speeds. NBN spent approximately $1.2 billion on the Internet-from-space program, and the end result is two spacecraft among the most capable commercial satellites ever manufactured. From their positions 22,000 miles above Earth, the NBN satellites will each broadcast through 101 spot beams covering all of Australia and offshore territories. Users can expect to see download speeds up to 25 megabits per second, and upload rates of 5 megabits per second, according to NBN’s website. “Australians will be able to live in remote areas in aboriginal communities, and yet still be economically active via the connectivity this space platform will provide,” Switkowski said. Made by Space Systems/Loral in Palo Alto, California, the NBN satellites broadcast in Ka-band signals, and the satellites are so large the manufacturer had to introduce new antenna boom designs to fit inside rocket’s fairing enclosure. Six-year-old Australian primary school student Bailey Brooks selected the Sky Muster name for the first NBN satellite after a nationwide competition. The Arsat 2 satellite accompanied Sky Muster on Wednesday’s rocket ride, becoming Argentina’s second geostationary communications satellite. Made in Patagonia by Argentina’s INVAP industrial contractor, Arsat 2’s launch comes nearly one year after Arsat 1’s deployment to become Argentina’s first large-class telecom satellite. Equipped with transponders in Ku-band and C-band, Arsat 2 is tailored for direct-to-home television broadcasts, Internet services, data networking and telephone applications. Its mission is expected to last at least 15 years. The Argentine government chartered Arsat to secure the nation’s rights to the 81 degrees west orbital slot. Bianchi said the Arsat 1 satellite is fully operational, serving schools, providing 25,000 households with digital television, and helping scientists in Antarctica keep in touch with their families. Before Wednesday’s launch, Arsat signed an agreement with Arianespace for the launch of the Arsat 3 spacecraft on an Ariane 5 rocket in 2019, plus options for two more satellite launches through 2023. 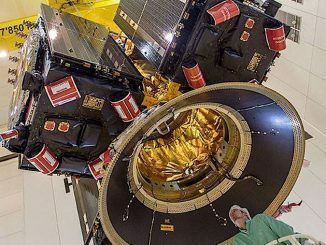 The next Ariane 5 mission is tentatively scheduled for Nov. 10 with the Arabsat 6B and GSAT 15 communications satellites for customers from Saudi Arabia and India.